For my daughter's first birthday, I did NOT want to serve everyone cake. I'm tired of birthday cake. Birthday girl was going to tear into her own little cake anyway. 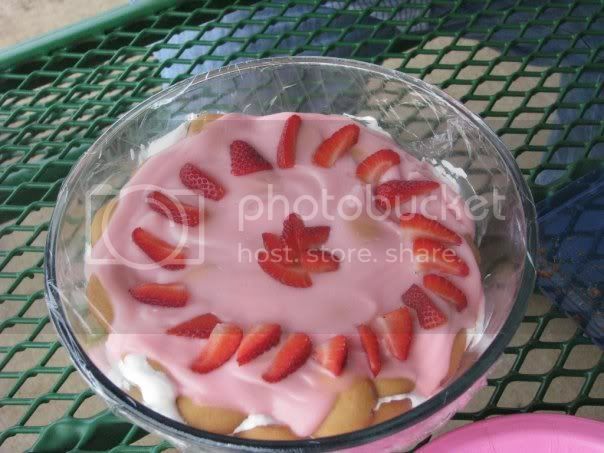 So I decided to make strawberry shortcake. But the party was going to be us and Cats and FQ and their crew, and I didn't want to assemble individual shortcakes for that many. 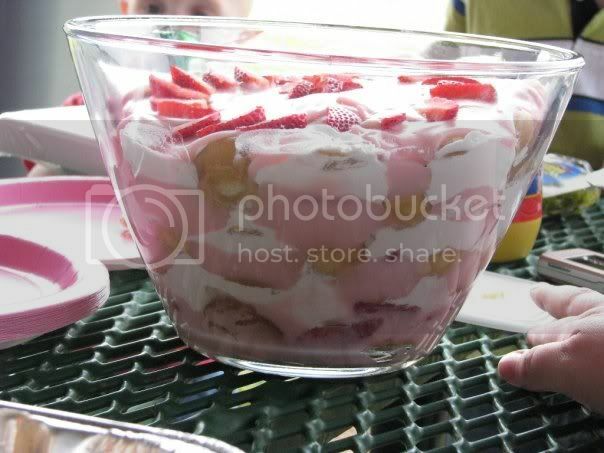 So I was thinking about how I could do it like a trifle or something, but I was worried about my sugar coated strawberries making pound cake soggy. I let Cats in on my dilemma and she suggested doing it like banana pudding, with pudding and vanilla wafers. Yes! Wal-Mart was COMPLETELY out of vanilla pudding (who needed that much vanilla pudding???) so I used Jello brand strawberry pudding instead. This is what I came up with! It was SO good!! We totally brainstormed and came up with something awesome! Now we want to try other combinations. I know TW did a chocolate banana pudding a while back. I want to try chocolate strawberry or dreamsicle next time!